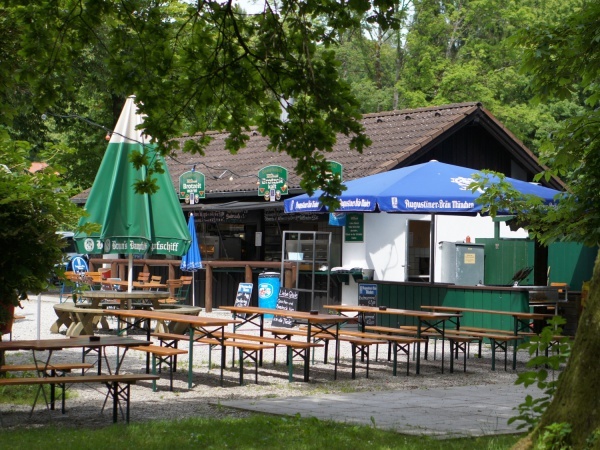 The small beer garden Dampfschiff is located directly at the Amper river in Grafrath, about 35 kilometres south west of central Munich. Dampfschiff is an ideal stop-over for bicyclers en-route Ammersee or rafters floating downstream in the direction of Fürstenfeldbruck. The name Dampfschiff translates into steamboat. Just behind the restaurant and beer garden was once the pier for the steamboat, which between 1880 and 1939 took passengers from and to the Ammersee. Day-trippers from Munich came by steam train to Grafrath, where the tracks ended. The only way to continue their journey to the village of Stegen at Ammersee was by steam boat along the Amper river. The nobleman Hugo von Maffei operated the "Marie Therese" steam liner until the rail service was extended to the village of Herrsching at Ammersee, making the boat service economically inviable. During the operation of the steam boat, Dampfschiff was a popular beer garden and restaurant amongst travelers between Munich and Ammersee, as indeed it remains today. Today there are no steam boats stopping at Dampfschiff anymore. Instead there are dinghies and kajaks launched a few steps away from the beer garden. The beer garden has about 300 seats, divided into a self-serviced area with traditional beer garden benches and a serviced area with regular tables. Unfortunately most of the beer garden is shaded by large sun umbrellas, whereas only a few large trees provide shade. The food stall in the self-serviced area offers typical beer garden food, such as Obatzda, Leberkäs (meat loaf) and spare ribs. A specialty is the Steckerlfisch, a freshly grilled whitefish from the Ammersee. A Maß Augustiner costs €5.80 (April 2013). The serviced area is located on an elevated terrace. There are regular music events in the beer garden with various music bands performing live on a stage on Sundays. Dampfschiff opens from Monday to Thursday at 3pm, on Friday at 1pm, on Saturday at 11am and on Sunday and public holidays at 10am. The beer garden closes at 11pm, sometimes even at midnight.